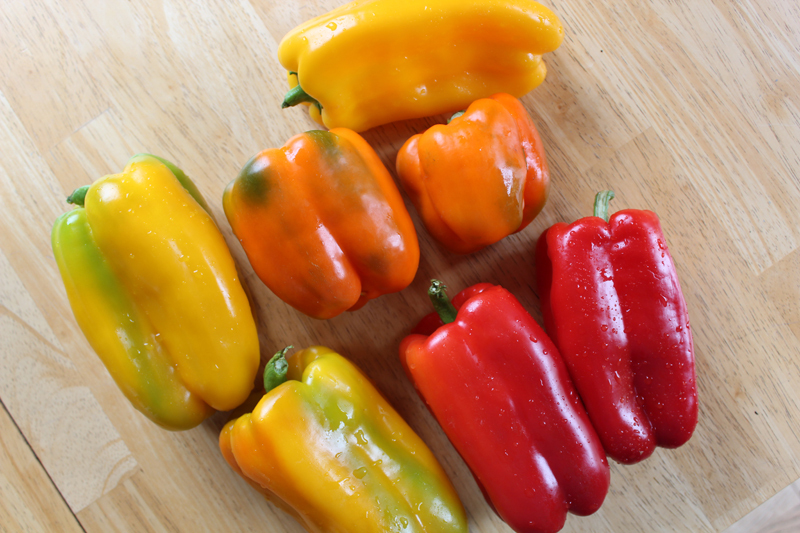 This time of year, the beautiful bell peppers are abundant at the farmers market. Red - Yellow - Orange - you can get them all! You can get green bell peppers too... but ain't nobody got time for that. 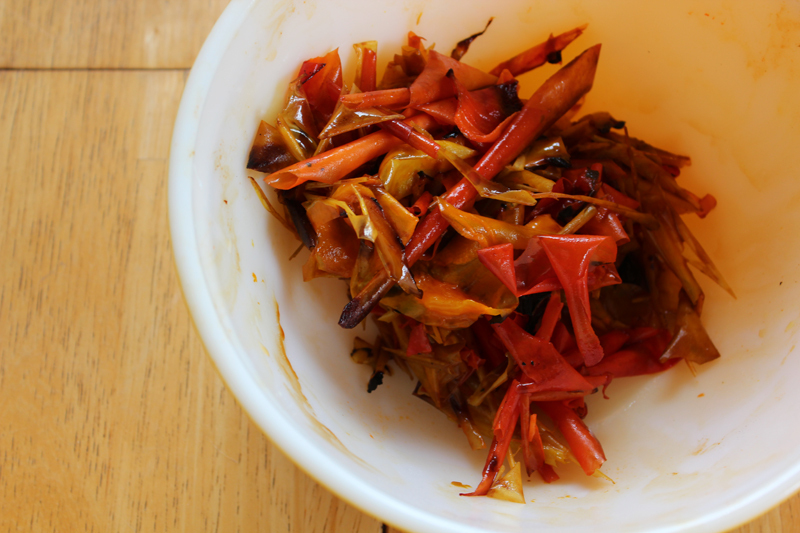 Every year, around this time I pick out a bunch of really beautiful peppers to roast up and then preserve for the winter months, when recipes calling for bell peppers are otherwise a sad reminder of happier days. This way, I can open the freezer in the depths of February, and beautiful, colorful beams of summertime will be mine. Here's a little tutorial so you can do it too! Next, take each half and use your hands to flatten it. It's really fun! You just kinda crush it and it flattens out. Spray on a little bit of oil with an oil sprayer... or you could brush some on. Just a tiny bit will do. ~ Preheat your oven to 400F. 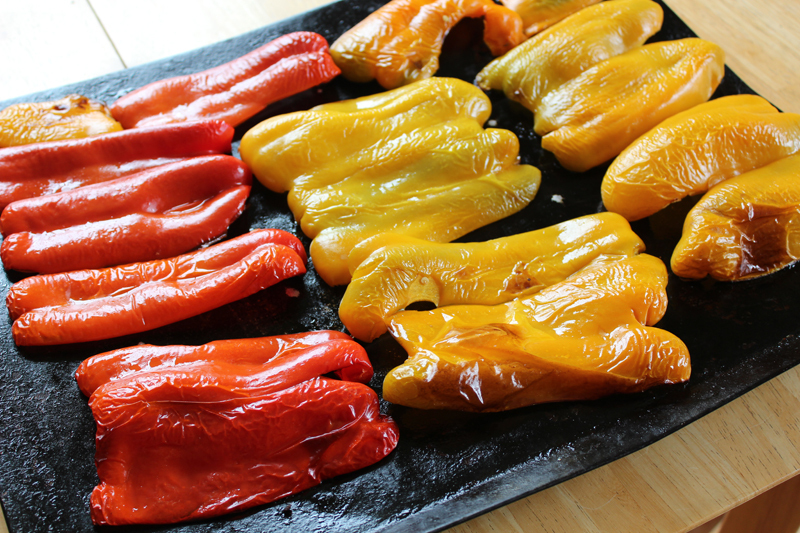 Roast your peppers for 20-25 minutes, until the skins are wrinkly but not super charred. I usually rotate the trays at least once during that time. Once you get them out of the oven, stack them all up on top of each other, and then cover them with a dish towel to steam for another 15 minutes or so. This helps the skins loosen. Taking the skins off can be little bit annoying, but if you have some good music or podcasts to listen to, you can just take your time and try to be zen about it. Just go slowly and peel off as much skin as the peppers will give you. Don't worry if you don't get every last little bit off. 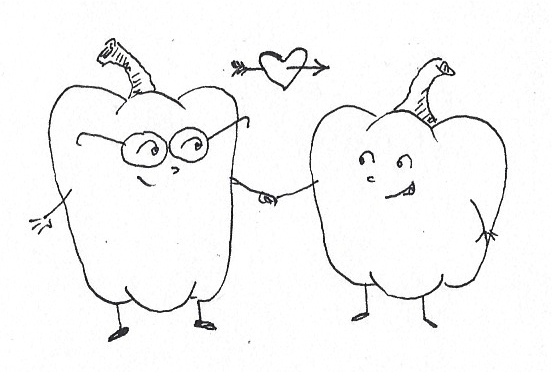 Also, if there are any pepper juices that drained off - you should save it for something. That stuff is umami gold! I put all my roasty little pepper skins into my bag of veggie bits in the freezer that I use for making vegetable broth. The next batch of broth will be super yummy! 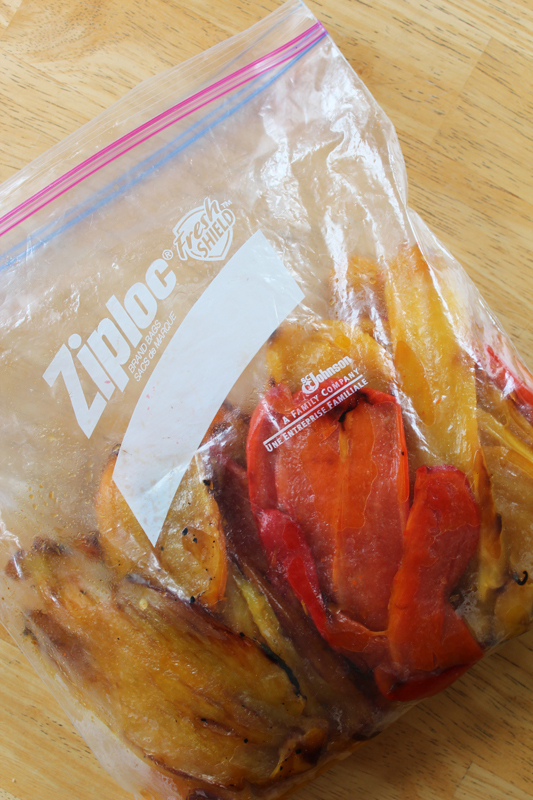 Finally, put all your roasted pepper pieces in a good quality freezer bag, and tuck them into the freezer. This whole project takes about an hour or so, but much of it is inactive - so you can be surfing MoFo posts or folding laundry or whatever. And, come wintertime, you'll be glad to have all those lovely peppers in your freezer!! 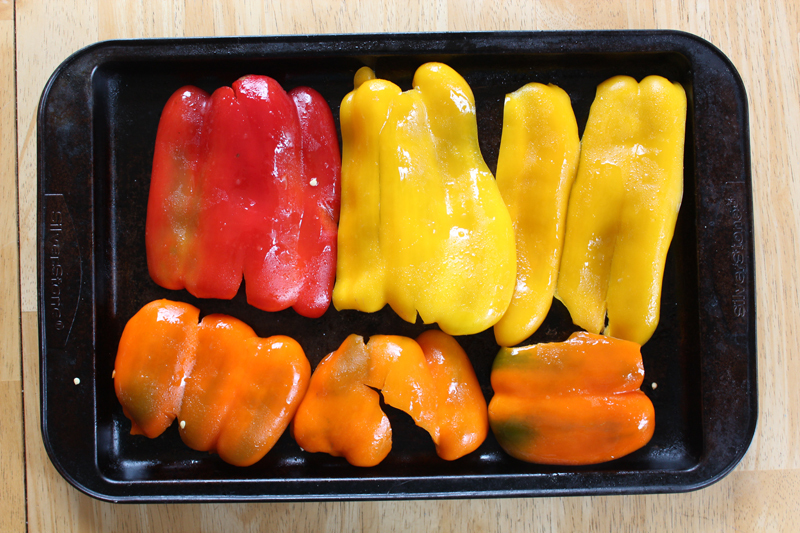 I should try this but whenever I roast peppers I just want to eat them all. I don't have that problem. I like roasted peppers, but they aren't a huge deal for me. I actually like fresh peppers the best! Freezing them is such a great idea! Can't believe I never thought of that...! that's how I felt when I first heard about it! I only started doing this 3-4 years ago, and now I am hooked! 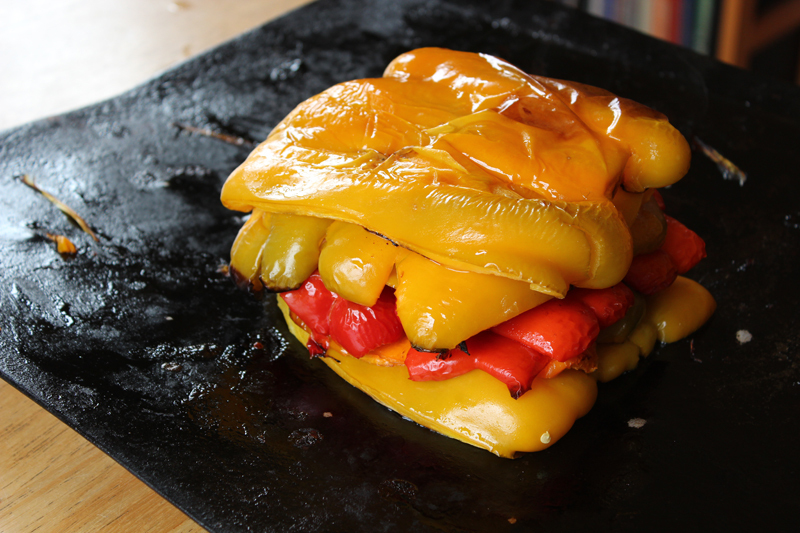 How do you use the frozen peppers later? Does the freezing/defrosting change the texture at all? They are really easy to use. I don't think it changes the texture much at all. They are easy to break apart from one another once frozen, and actually, they are really easy to chop when they are still frozen. This method of roasting them in the oven cooks them a little less than broiling them over an open flame. That's good too- but I figure the freezing and thawing will also continue to soften the peppers a little, so that's why I prefer this method for preserving. yum! did you know they also freeze really well raw? i just chop mine up, clean out the seeds and put them in a plastic freezer bag. we'll use them all the way through spring! no! I didn't know that! Thanks for the tip! Maybe I will freeze some fresh ones too. 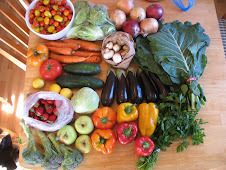 I really love having peppers on hand, and I don't like buying non-organic ones from South America in the winter time. Thanks Kelli!! I never thought of freezing roasted peppers! Brilliant! I've been getting sad about the end of the season.